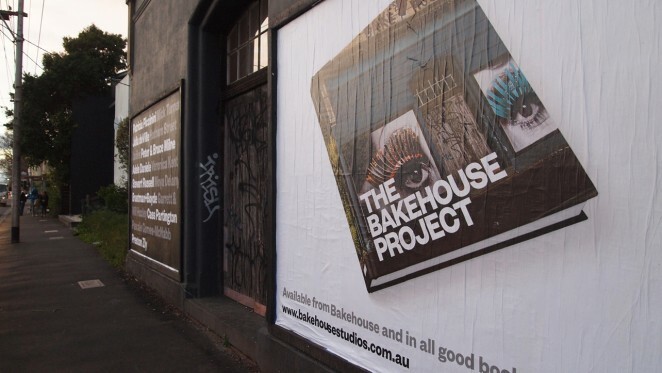 Melbourne’s music and art worlds collided last night at the launch of The Bakehouse Project, a fascinating art book celebrating a year in the life of Bakehouse Studios. 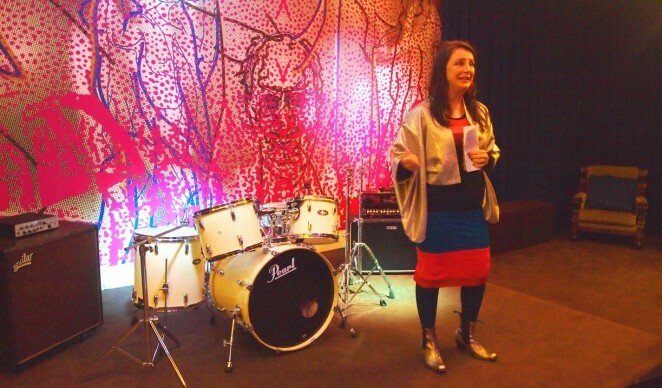 On the heels of their Sidney Myer Performing Arts Award— the Facilitators Prize for their contributions to the Australian music industry and creative arts practice—Helen Marcou and Quincy McLean celebrated the release of The Bakehouse Project with Melbourne’s arts fraternity. Saluting a year at Bakehouse Studios, The Bakehouse Project is a unique blend of music, art and photography. The walls of Bakehouse drip with the history of Australian music, and after the success of a giant paste-up tribute to Lou Reed, Helen and Quincy invited a group of visual artists to create installations in the Bakehouse rehearsal rooms. This full colour, hardback book documents a world-first collaborative project in the tradition of Melbourne Now and features artists such as Patricia Piccinini, Mick Turner, Peter Milne, and The Hotham Street Ladies. Helen Marcou proudly took media on a tour of the facility prior to the launch proper and delighted in telling us tales of each room’s history, the characters who have inhabited them and the vision of the individual artists who have curated the refurbishment. It was also heartwarming to hear of Helen and Quincy’s recycling ethos, with the renovated rooms featuring re-used materials from iconic local landmarks such as The Corner Hotel’s old carpet and the Jam Factory’s theatre curtains, among many other sentimental artifacts. Anyone who has visited the Bakehouse rooms will be familiar with the Glam Room’s depiction of the vibrant, mythical SOS band, the band without a song. One of the highlights of last’s night ‘s celebration was the coming to life of the uber-colourful SOS band in a wild, energetic live performance. Wrapping up a wonderful night, The Drones took on DJ duties spinning a quirky array of dance faves. Congratulations and thanks to Helen Marcou and Quincy McLean, (the owners of Bakehouse Studios since its founding in 1991) not only for producing an amazing book but for their tireless service to Melbourne’s arts community. The pair were responsible for launching SLAM (Save Live Australia’s music), an activist group that staged the SLAM rally of 2010, which was described as ‘the largest cultural rally in Australia’s history’. 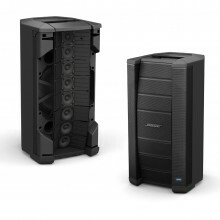 Through SLAM, they were able to bring about the Agent of Change laws in 2014, which protects music venues from noise complaints by new residential developments. Around 400 musicians, local and international, pass through Bakehouse Studios every week. Over the years, acts like The Saints, Paul Kelly, Rowland S. Howard, The MC5, Mark Arm (Mudhoney), Evan Dando (Lemonheads), Tool, Janes Addiction, Deftones, Augie March, Little Birdy, The Panics, X, Died Pretty, Steve Kilbey, The Triffids, Beasts of Bourbon, The Scientists, Dallas Crane, Sufjan Stevens, Dave Stewart, John Butler Trio, Jimmy Little, Blackeyed Susans, Vika & Linda Bull, Daddy Cool, Deni Hines, Underground Lovers, Wanda Jackson, Olivia Newton-John, Jessica Mauboy, Tame Impala, Powderfinger, Bill Callahan, Beth Orton, Cat Power, Elvis Costello, The Rockwiz Orchestra, Ladyhawke, Icehouse, Neil Finn, Pere Ubu and many more have passed through the Bakehouse doors. The facility has become a much-loved, iconic hub for Melbourne’s arts community. 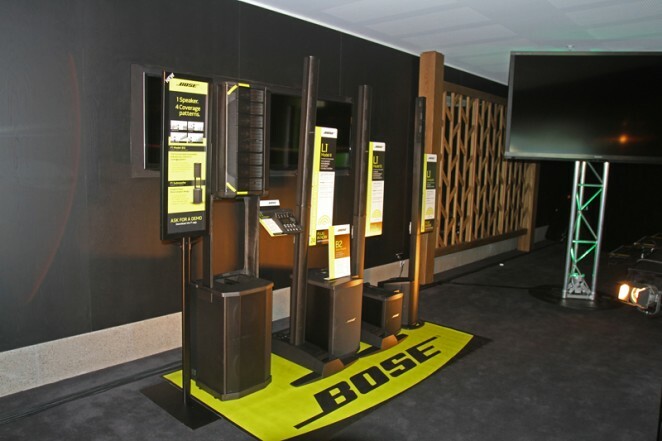 The Bose F1 Model 812 and F1 subwoofer Launch Event for Australia and New Zealand was held recently at the Stables Room at Royal Randwick Racecourse in Sydney. There were three sessions across the day and evening for guests who had flown in to listen to the ground breaking F1 first-hand. 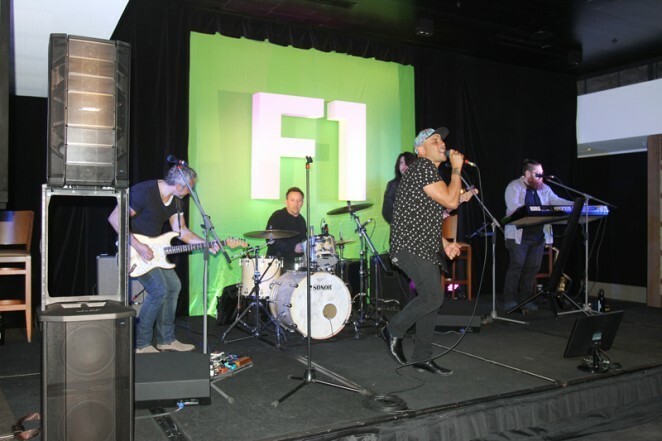 They had a full five piece band, featuring some of Australia’s best known working musicians who rocked the room and showcased the capabilities of the F1 system by performing well known songs from Van Halen, INXS and Cold Chisel. Feedback from attendee’s was overwhelmingly positive and excitement levels are now very high for the stock to be in stores September. In today’s Melbourne Guitar Show tip of the day, local bass great Joe Creighton chats about being a singing bass player. For Blur, a band which provided the soundtrack to the lives of so many, there was always a danger that an Australian tour almost two decades since the last might tarnish some treasured memories. At Melbourne’s Rod Laver Arena, Damon Albarn and co quickly allayed any of those fears with a performance which was as vibrant and relevant as it was nostalgic. Strolling onto stage spraying the audience (and probably a few photographic lenses too) with water from the get go, it was clear Albarn was in a larrikin mood. Launching into Go Out from their latest album, it set the scene for a Magic Whip-dominated set list with almost a third of the show’s tunes coming from the new record. Fortunately, The Magic Whip is a quality album and trippy tunes such as Thought I Was A Spaceman and Ghost Ship gave guitarist Graham Coxon an opportunity to shine amid the atmospheric effect of mood lighting and the giant mirror balls behind stage. Albarn charmed the audience with tales of his fondness for Melbourne and a revelation that he began writing The Magic Whip while in our city last year. His many forays into the audience and the invitation for a lucky few to join him on stage, made him even more endearing to the crowd. With Beetlebum the energy in the house rose a notch and the check box of hits began to claim ticks. For this tour, Blur had brought their A game, with four smooth looking, Afro-American backing singers to the left and on the opposite side of the stage, a less sartorially-attired four-piece brass section. At the rear Mike Smith, who has also been part of the Gorillaz band, provided textural piano and synth. On drums, Dave Rowntree kept it eternally tight, while Alex James provided his signature loping bass lines, so much a part of the Blur DNA. Albarn’s vocal was astonishingly powerful, a trait which often gets buried in his other attractions. 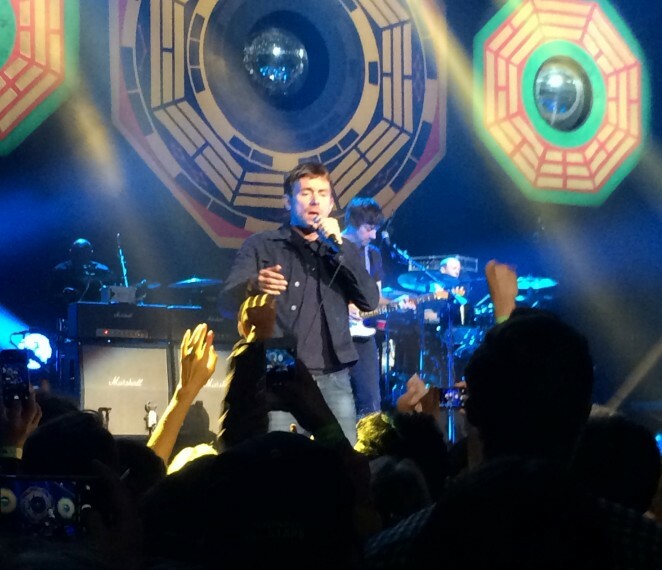 As the more familiar Blur fare came such as Tender, Parklife, and Song 2, the standing room only floor erupted into pogo, reverberating up into the seated areas. Albarn responded with Ronaldo-like victory poses, urging the room-energy to lift even more. An encore of Stereotypes, Girls & Boys, and For Tomorrow further fuelled the euphoria. 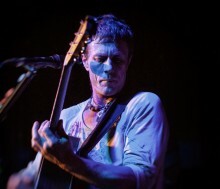 Albarn and band had held the Melbourne audience in the palm of their hands all night, and suitably finished with the lyrical refrain of ‘just let go’ from The Universal, off the band’s The Great Escape album. It took 12 long years for Blur to follow up Think Tank with The Magic Whip. 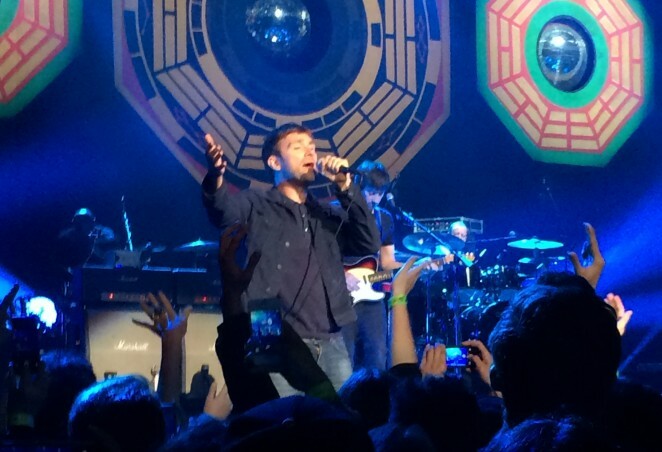 With a new Gorillaz project a priority for Albarn, the future of Blur is unclear. However, for those in the Rod Laver Arena audience who have followed Blur since they were four young geezers from London, they got to witness them at least once as one of the world’s greatest bands.